Friendly pirates and oyster farmers, local chefs and Martha’s Vineyard artists are just some of the people you may meet on a food adventure with Farm.Field.Sea. this season. “Bringing people to the source of their food is my goal. 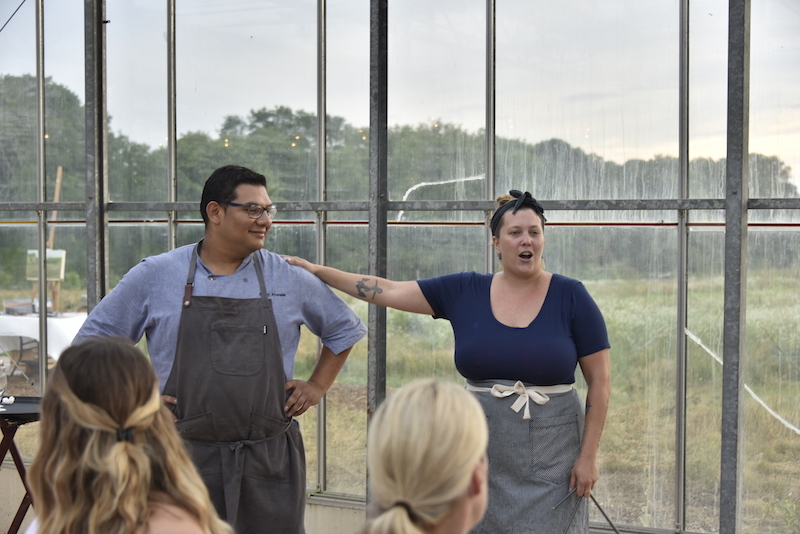 There are so many amazing and talented producers on this Island,” says Nevette Previd of Vineyard Haven, who began producing these farm-to-table dining events five years ago. Every season has been different, Nevette says: “I just constantly want to keep evolving.” In her first year, she partnered with chef Chris Fischer; since then, her scope has continued to widen and now includes farmers, fishermen, artists and musicians. 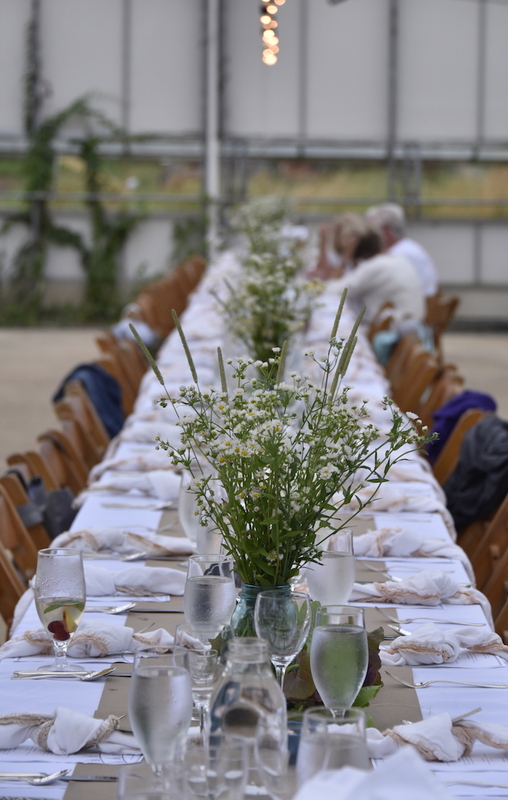 In 2016, a series of Farm.Field.Sea evenings called Gather paired locally-sourced dinners with sustainability-oriented speakers. Last year, among other events, Nevette teamed up with Morning Glory Farm flower manager Robyn Hosey Athearn for flower tours and workshops at the Edgartown farm. The themes may change from year to year, but Nevette’s underlying mission remains the same: to connect people with local food and the Islanders who produce and prepare it. This summer, Nevette is introducing two new concepts. The first takes the farm-to-table approach offshore with Oysters & Aquaculture tours, where the farm is the ocean and the table is on the deck of a pirate ship (see below). The second concept is a series of weekly pop-up dinners called Makers Table at locations around the Vineyard, where local chefs prepare Island-grown ingredients while Island artists perform and paint. For the Makers Table dinners, Nevette partners with Island chef Spring Sheldon as well as guest chefs, fishermen, farmers, visual artists and musicians. There’s also an educational element, such as a tour or talk. 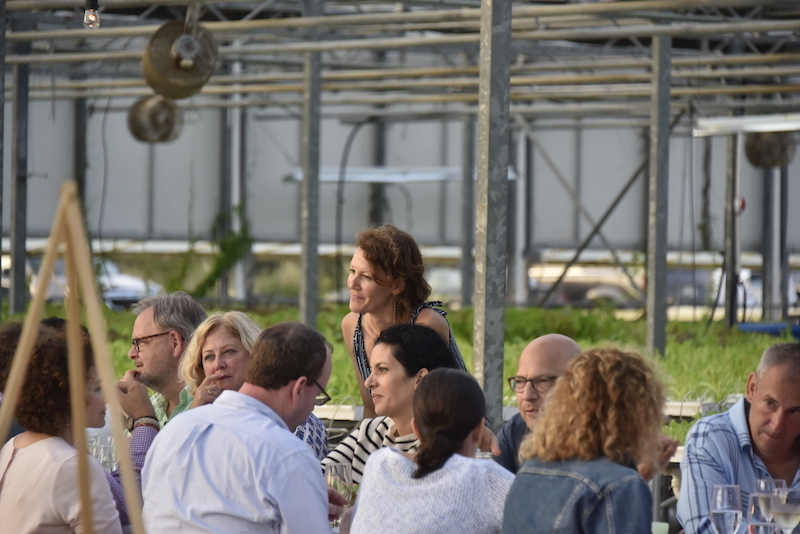 July’s first Maker’s Table took place in the greenhouse of the nonprofit Island Grown Farm Hub on Stoney Hill Road in Vineyard Haven. A long stretch of seven tables held places for more than 60 diners, who began the evening with passed hors d’oeuvres and a fruit-laden white sangria. Inside the airy greenhouse, surrounded by banks of hydroponic crops—blood sorrel, basil and strawberries among them—Island musician Anthony Esposito performed original compositions on guitar. 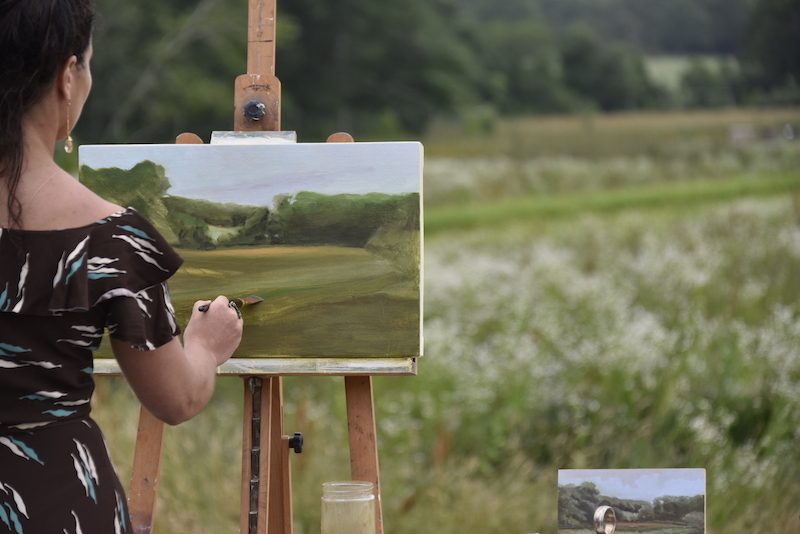 Outside, as the sun descended, artist Alexis Russillo chatted with guests as she painted an Impressionist plein air landscape of the fields and trees. Before the dinner bell rang, guests also had two opportunities to tour the Farm Hub greenhouses with director Matthew Dix and manager Taz Armstrong. For the meal itself, chef Spring partnered with Isola chef Jimmy Alvarado to create a locavore feast. Many of the ingredients came directly from the Farm Hub greenhouses—vegetables, of course, but also the main course: trout raised in vats just steps from the dining table. The dinner also highlighted other producers including North Tabor Farm, whose hakurei turnips spiced up the salad, and Martha’s Vineyard Mycological, which provided shiitakes for a luscious farro risotto (“I call it farrotto,” chef Jimmy said, as he visited with each of more than 60 guests at the table). “It’s a field trip and a dinner, both in one. I love it,” said Bob LaRoche of Westford, who with his wife Charlene had received a gift of tickets to the evening. “And you’ve got the arts in there as well,” added Charlene. Both agreed they’d like to do another Makers Table, with other couples they know—“make a full evening of it,” Bob said. Makers Table dinner events begin at 6 p.m. each Tuesday night in August, with the exception of August 7. 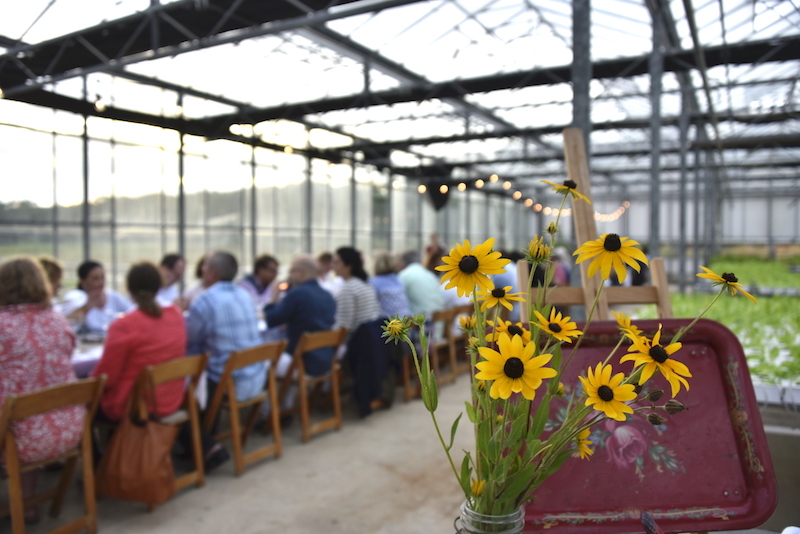 That week’s dinner will take place August 9, again at the Farm Hub. Other Makers Table locations include Beetlebung Farm (August 14), the Tisbury Spring building (August 21) and the Yard in Chilmark (August 28). Details and ticket information are posted at farmfieldsea.com/makerstable. Aboard the Sea Gypsy out of Oak Bluffs, floating home of Pirate Adventures Martha’s Vineyard, Island shellfish expert Rick Karney provides an informative show-and-tell about local bivalves—including a look at the ring of blue eyes a scallop hides inside its shell. 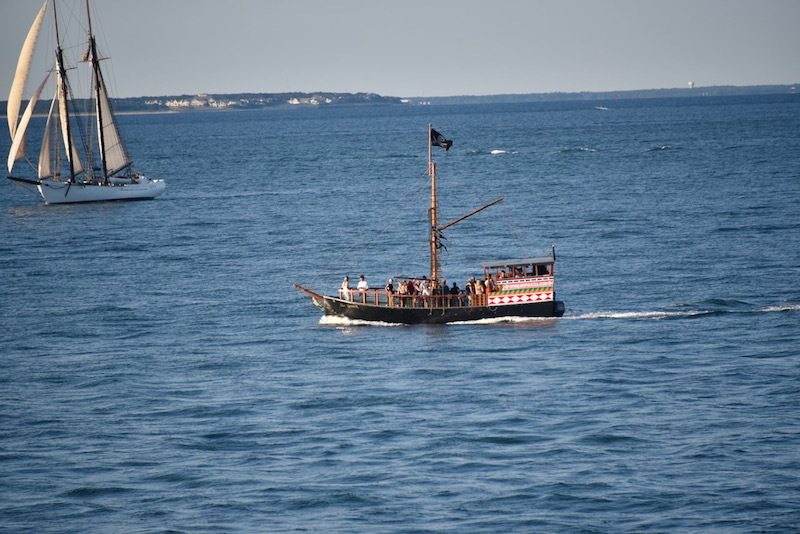 As passengers cluster around Rick, the Sea Gypsy’s smiling Capt’n Flint (Vineyarder Jeremiah McCarthy) pilots his 40-foot vessel to the waters of Vineyard Sound off Eastville. This is Farm.Field.Sea’s Oyster and Aquaculture Tour, and this is also New England’s only open-sea oyster farm, Cottage City Oysters. The two young men coming alongside in a workboat are oyster farmers Dan and Greg Martino. Tying up to the idling Sea Gypsy, the Martino brothers talk with passengers about growing fresh oysters in open water and why it’s good for the planet. Then Greg and Dan come aboard with a sack of their freshly-harvested oysters and continue the conversation while shucking and sharing the plump and briny treats. Only sea birds get their shellfish fresher. A sumptuous tray of cheese, crackers and crudités rounds out the waterborne meal, with soft drinks and light adult beverages: rosé wine and fresh Bad Martha beers. As the sun sets, the Sea Gypsy makes its way back to Oak Bluffs Harbor after an approximately two-hour cruise.